UPDATE 10/29/2012: VENUE HAS BEEN CHANGED DUE TO CAPACITY LIMITS! Greetings Little Lattes! Ready for our next event? This is an event you don’t want to miss! Have no plans for Halloween yet? Want to party with dino bones? You are cordially invited to join us for Halloween at the Ti$a Halloween Ball on Wednesday, October 31, 2012. 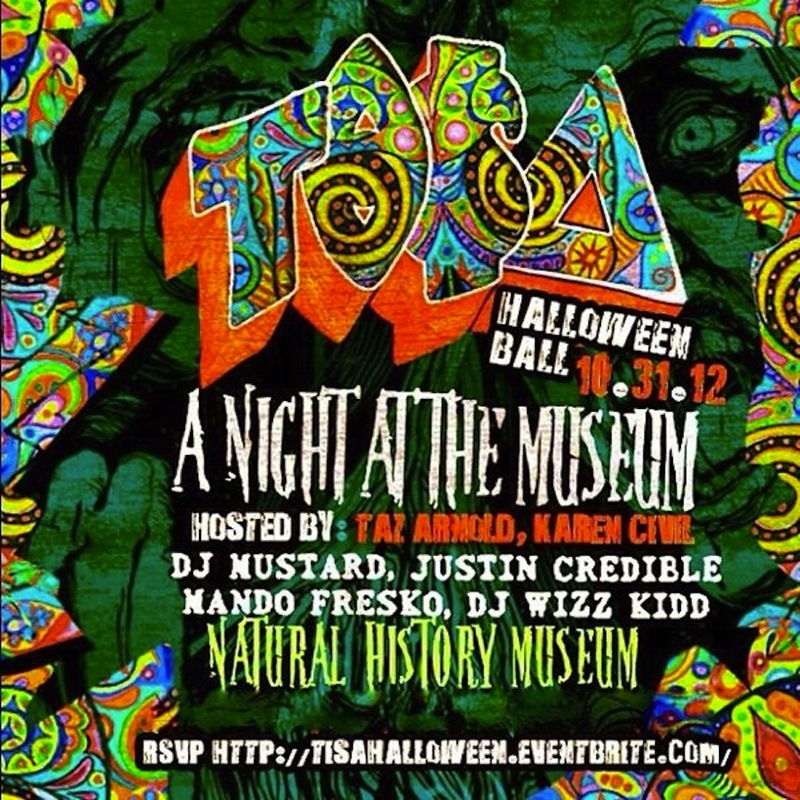 The fright festivity will be at the Natural History Museum hosted by Taz Arnold and Karen Civil. Music spinning by DJ Mustard, Justin Credible (of Power 106 and LA Leakers), Mando Fresko (also of Power 106), and DJ Wizz Kidd. A special guest performance will be announced soon. Special Invited Guests include: Dwight Howard, Chris Brown, Big Sean, Justin Bieber, ASAP Rocky, Mac Miller and many More. Official Sponsors Include: Ti$A Records, Ti$A Vision, InkFloThreads, Colors LA, and Jarritos. Tickets are being sold fast, a full house is expected! The last Tisa “Endless Summer” Mansion Party was a huge hit, so missing this one will be a huge mistake! Dress to impress! Your most fashionable and creative costumes are highly encouraged! Excited as much as we are? Gather up your best costumes and we look forward to meeting you! Don’t forget to say hi when you see the LLL Ladies at the ball. ← LLL Speaks to “Students in Fashion” at CSULB!